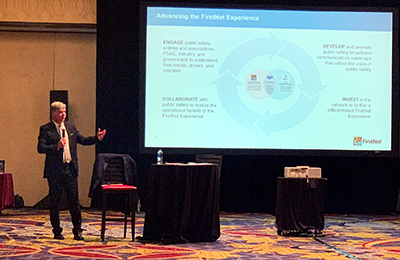 The latest stop along our public safety roadmap led the First Responder Network Authority (FirstNet Authority) to Atlanta, Ga., last week for a regional forum with the Police Executive Research Forum (PERF). As a policy and research organization for the nation’s law enforcement community, PERF is delivering a series of forums that explore the adoption of FirstNet by police and other public safety users around the nation. The work by PERF is helping the FirstNet Authority and AT&T gain a better understanding of how broadband is being operationalized today by public safety. These engagements also produce actionable feedback on the type of tools that public safety agencies might need to help them take better advantage of all that FirstNet has to offer them. For the FirstNet Authority, last week’s forum in Atlanta provided us with an opportunity to engage with nearly 100 first responders on our plans to develop a Roadmap for enhancing FirstNet. The Roadmap will look at improvements to the network over the next 5 years, identifying and pursuing opportunities that ensure technology innovation, policies, procedures, and programs that benefit public safety users. As a longtime advocate for a dedicated public safety network, PERF has been a valuable advocate for the FirstNet Authority throughout the planning and design of the network to ensure it meets the needs of law enforcement. Now with the network in operation, we will continue to work with PERF and public safety organizations around the country to enhance FirstNet and ensure that public safety’s voice and operational needs guide our investments in the network. I would like to thank PERF Executive Director Chuck Wexler for the opportunity to meet with the organization last week and for his leadership and support for FirstNet over the last several years. The FirstNet Authority looks forward to continuing to work with PERF to advance and innovate the network for all of public safety.